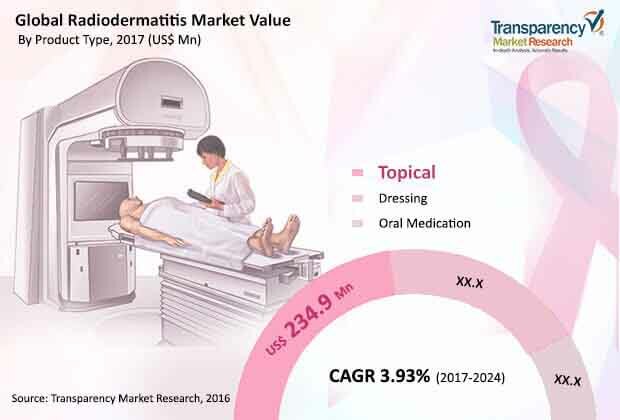 A newly compiled business intelligence report at Transparency Market Research (TMR) has observed that the shares in the global radiodermatitis market are moderately consolidated among a handful of players. Some of the key players of the radiodermatitis market, such as 3M Healthcare, Acelity, Molnlycke Health Care, Smith & Nephew PLC, and Convatec, Inc., are prominent names in the field of medical devices and drug manufacturing, and are constantly pursuing the development of innovative products as well as expanding geographically to find unmet demands. Increase in marketing and promotional strategies in emerging economies and making efforts to educate patients as well as medical staff about the benefits of their offerings are likely to help companies to add to their market shares. On the other hand, there are a number of local players too who cater to domestic demands with generic products that are low on cost and popular in those territories. Going forward, key companies of the radiodermatitis market are expected to aspire product differentiation via innovation to stay ahead of the curve. According to the projections of the TMR report, the demand in the global radiodermatitis market will increment at a CAGR of 3.93% during the forecast period of 2017 to 2024. In terms of revenue, the market for radiodermatitis products is estimated to attain a valuation of US$421.5 million by the end of 2024, swelling up from its evaluated worth of US$321.9 million as of 2017. Based on product type, the report segments the radiodermatitis market into topical, oral medication, and dressings. The topical segment has been sub-segmented into hydrophilic creams, corticosteroids, antibiotics, whereas oral medication has been bifurcated into corticosteroids and others such as oral analgesics and antibiotics. Dressings segment has also been divided into no sting barrier film, hydrocolloid, honey impregnated gauze, hydrogel, silicone coated dressing, and others such as silver leaf dressing and GM-CSF gauze. On the basis of distribution channel, the market for radiodermatitis has been classified into hospital pharmacy, retail pharmacy, and online stores. Geographically, Asia Pacific has been identified as the most lucrative region, owing to its vast population base. Apart from the strong prevalence of cancer and consequently increasing demand for radiation-based chemotherapy, the radiodermatitis market is being fueled by increased number of industry-institute and industry-academia partnerships. A number of companies are exploring research studies, clinical trials, and product development in collaboration with hospitals or academic institutions. This has often led to a positive outcome, that is, a product launch, fuelled by the eclectic mix of minds coming together through such partnerships. Increase in factors influencing co-morbid conditions and adverse events during radiation with chemotherapy, innovation in product offering, and partnerships and agreements pertaining to manufacturing and distribution of radiodermatitis products are some of the other drivers of this market. On the other hand, introduction of better radiation therapy equipment that cause lesser side effects such as proton therapy and intensity-modulated radiation therapy (IMRT), cost of the products, and regulatory hurdles are foreseen as a few restraints of the radiodermatitis market.